ข Haniyeh was dismissed by President Abbas in favor of Fayad. Along with the Palestinian Legislative Council, however, Haniyeh does not acknowledge the legitimacy of his dismissal. Since 14 June 2007, Haniyeh has exercised de facto authority in the Gaza Strip, whereas Fayad's government retains authority in the West Bank. ↑ The Palestinian law, approved by the PLC in May 2002, states in article 3 that "Jerusalem is the Capital of Palestine". 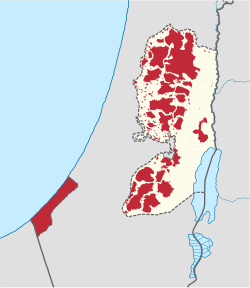 Ramallah serves as the administrative capital and the location of government institutions and representative offices of Australia, Brazil, Canada, Colombia, the Czech Republic, Denmark, Finland, Germany, Malta, the Netherlands, South Africa and Switzerland. Israel's claim over the whole of Jerusalem was not accepted by the UN which maintains that Jerusalem's status is pending final negotiation between Israel and Palestinians. ↑ 3.0 3.1 3.2 "CIA – The World Factbook". cia.gov. ↑ "The Palestinian government". CNN. 5 April 2001. สืบค้นเมื่อ 2012-11-26. ↑ Associated, The (2012-12-18). "Palestinian Authority officially changes name to 'State of Palestine'". Haaretz Daily Newspaper. สืบค้นเมื่อ 2013-01-05. หน้านี้แก้ไขล่าสุดเมื่อวันที่ 24 มิถุนายน 2560 เวลา 20:22 น.